TrackMan Pro measures and displays the full trajectory of any shot, from 6-foot pitches to 400-yard drives, pinpointing the landing position with an accuracy of 1 foot at 100 yards. Delivering state-of-the-art data without using any modeling, TrackMan Pro displays the shot’s actual 3D trajectory in real time together with all impact and ball flight information. Whether you play, provide services or develop product, TrackMan Pro will drive results for you and your business. Every TrackMan Pro features a built-in hi-speed camera and our cutting-edge TrackMan Performance Studio software – the world’s first and only swing and shot analysis tool to totally integrate video with TrackMan data. A non-video version of the TPS software is available as well. TrackMan Pro provides you with the industry’s most accurate swing and ball flight analysis solutions including golf’s most talked about shot making benchmark test, The TrackMan Combine. 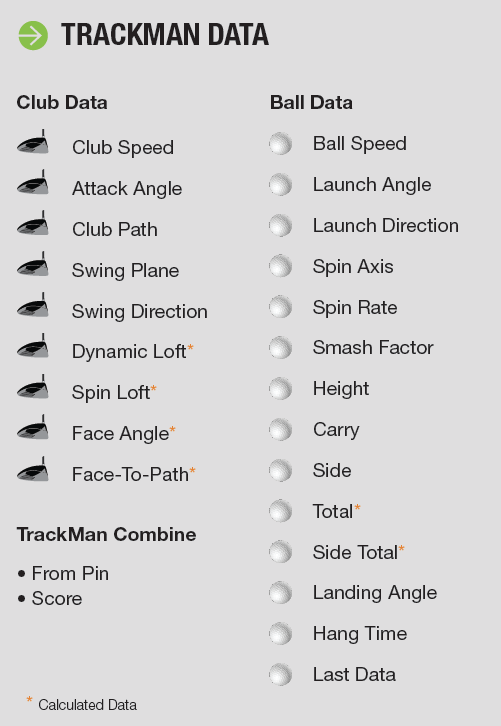 The TrackMan Combine is a standardized test that enables golfers to identify their shot making skills as well as benchmark their performance with players of any level. The TrackMan Performance Studio delivers the definitive data and visual report on golfers by totally integrating video with TrackMan’s industry leading swing and shot data. The TrackMan Performance Studio provides 3D imaging of the ball flight, club path, face angle, and more, calibrated directly into the video you shoot with the TrackMan radar unit’s built in hi-speed camera or with up to six slaved external cameras. The Performance Studio includes a full suite of video swing analysis applications and over 50 tour player models in a scalable user-friendly interface. The TrackMan Performance Studio turns your laptop into the ultimate live teaching and player performance studio, with all sessions, client data and videos stored and managed in one flexible, easy-to-use workplace.